The other evening as I grabbed my camera for what’s become a ritual of last-minute dinner photography (“Wait! Nobody touch the food!”) Sam delivered some sage advice: “You need more people in your pictures.” Yes, the chickens are lovely, but it really is the people at Love Apple that make it so much fun to be (and eat) here, and truth be told, all my fellow apprentices are great cooks. Ellen makes a mean quiche. 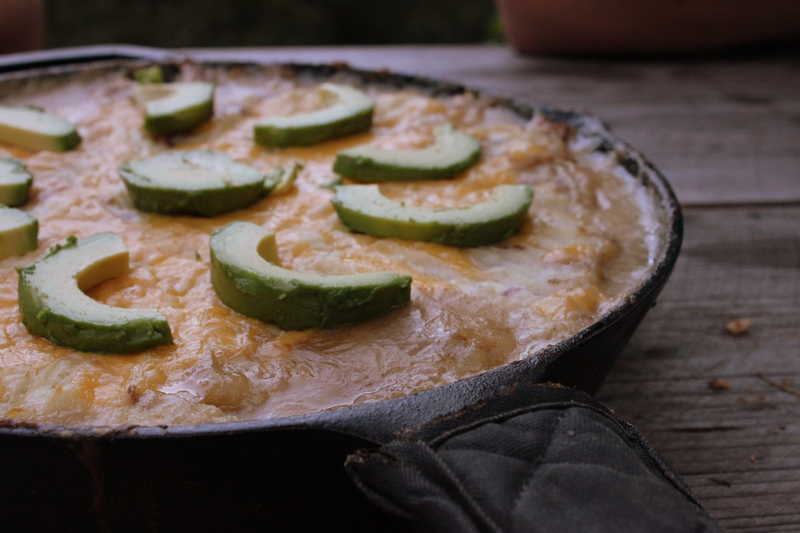 Christine does a gooey tortilla casserole. Sam bakes fragrant orange scones. Lisette whips up creamy peanut butter avocado dressing. 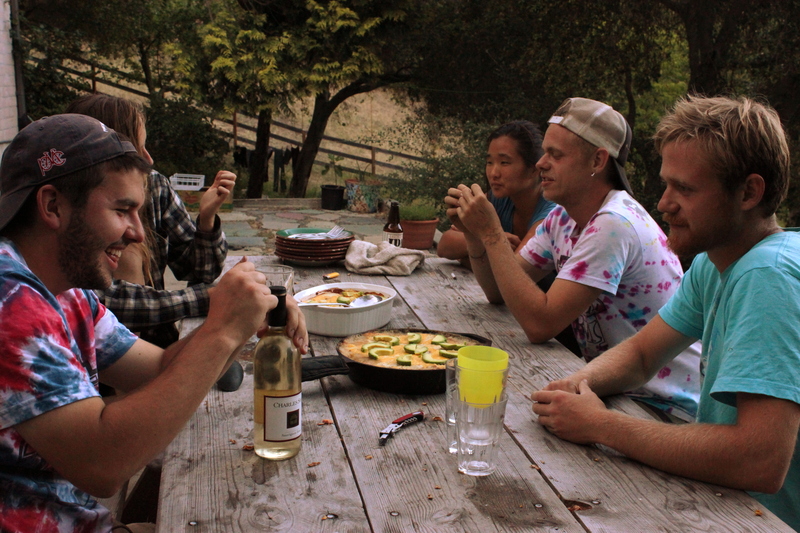 Zach does a spot-on version of Pim’s onion tart. Ross makes incredible sautéed mushrooms. And Phillip makes good everything (out of anything in the pantry—I never cease to be amazed). We eat well here every night, and over the past few weeks I’ve learned as much about making good food as I have in the past year. I’ve also learned a lot about enjoying food. I admit: I’ve been through several stages in my life where friends took one look at the things I cooked and labeled me a health nut. The first of these episodes occurred early in life—I have a distinct memory of my 13-year-old self substituting olive oil for butter and ending up with a lemon loaf that resembled an oozing brick. Growing up a girl in image-conscious Southern California (or anywhere, for that matter) it can be hard not to develop a controlling attitude towards food, be it what you’re eating or how much of it. Fortunately for me, I discovered life just isn’t worth getting up in the morning if you don’t find pleasure in what you eat. I have many eating pleasures, whether they be fried eggs in oatmeal, ramen from New York’s Ippudo, or cardamom pistachio ice cream from my new favorite place in Santa Cruz, The Penny Ice Creamery. The pleasures I’ve found here on the farm consist of deliciously hearty meals that usually at least three of us have a hand in, flavored with a healthy dollop of butter or bacon (my cast iron pan loves it) and seasoned with the appetites we build up working outside eight hours a day. As with the shepherd’s pie we had the other night, each meal is a bit of an adventure—some oyster sauce here, a little sliced avocado there—but that only makes it all the more enjoyable. 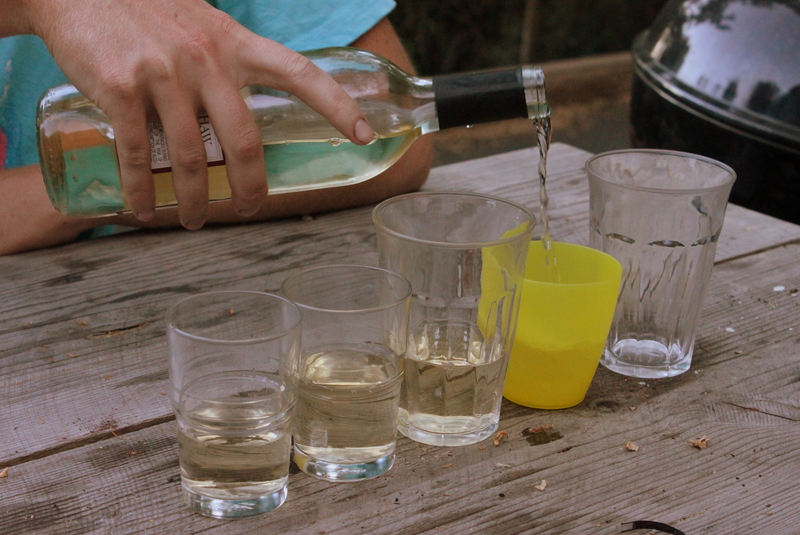 And speaking of enjoying food, no feast at the table outside the cottage would be complete without a glass (or mason jar, or plastic child’s cup) of wine from our dear friend Charles Shaw. Shepherd’s Pie is the ultimate vehicle for improvisation—make your mashed potatoes just how you like them, and taste and season the filling as you’re going along. This is the recipe for a more traditional meat version (we used ground turkey), but we also made a veggie version for the vegetarians among us with onions, corn, broccoli, and canned tomatoes. Preheat your oven to 350 degrees. In a large saucepan or skillet, sauté the onions over medium heat until translucent, then add in minced garlic. Add the ground turkey next and break up with a wooden spoon, browning the meat nicely. Stir in the corn, and season to your liking with salt, pepper, chili flakes and oyster sauce. Pour in the broth and turn the heat to medium-low, simmering and adding enough flour to thicken the juices. Meanwhile, assemble your mashed potatoes (Ross made ours with butter, goats’ milk, and garlic—use your favorite). When the liquid from the stock turns nice and gooey, turn of the heat and spread the potatoes in a thick layer on top of the meat (if your skillet isn’t oven-proof transfer meat to a baking dish first). Sprinkle the potatoes with shredded cheddar and bake until the cheese is melted and the liquid from the meat is bubbling up around the edges. Garnish with avocado slices and serve.